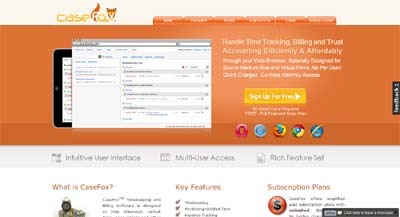 CaseFox Time Tracking and Billing Software is designed to help attorneys, virtual firms, accountants and other professionals (such as freelancers, contractors, etc.) with their time based invoicing, trust accounting, time tracking, case tracking and client billing needs. CaseFox can track both billable and non-billable hours and expenses, monitor unbilled hoatturs, late payments and handle trust accounting, case documents and case notes. CaseFox features role based user management and access to data.